Corn traded 1-2 cents lower for the overnight session and beans traded 4-5 cents lower. The trade is awaiting for the release of today’s WASDE report at 11 a.m. 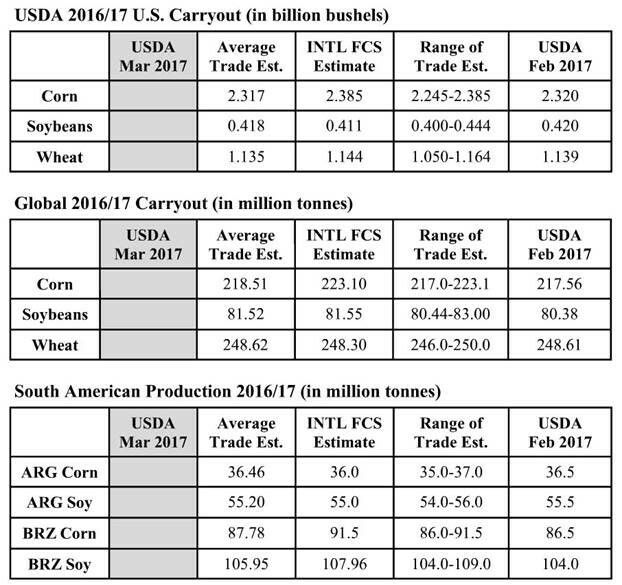 The focus today will be on changes to the South American production numbers. Any large increases to the corn or bean production numbers would be bearish to the markets. Crude oil closed sharply lower yesterday after EIA reported an increase of 8.21 million barrels to a new record high inventory of 528.39 million barrels. The trade was only expecting a 2 million barrel increase and as a result is trading about 4 dollars a barrel lower on the week. CONAB out this morning with a 107.6 MMT production estimate for Brazilian beans vs 105.5 MMT last month. Corn is up to 88.9 MMT vs 87.4 MMT last month. Both of these numbers are above what the trade is anticipating for the WASDE report. Weekly export sales out this morning were right in line with trade expectations.